We encourage everyone to join us in community animal welfare work, and are always on the lookout for new volunteers! If you are interested in getting involved as a volunteer, we would love to hear from you! Please contact us with questions or download an application. 3. Become a member. Membership fees help support our spay and neuter program with the Lakewood Animal Shelter. Download an application or pay via PayPal. 5. Visit our Petfinders.com page to see the latest animals for adoption. Print out their adoption profile pages and leave them at your favorite local hot spots and work. Select "Print Friendly" under an adoptable animal's profile picture. Constant promotion of the furry friends helps increase adoptions! We update the listing several times a week. 6. Visit out events page and help promote our up coming events. 7. Are you interested in volunteering with the animals such as off-site adoption events and assisting at the shelter on a Saturday? If so, please complete the city of Lakewood's application. It does require a background check and may take up to three months to complete. (The animals are so cute - so don't be discouraged by the delay). See below for more information about shelter volunteer duties. Questions about working with the animals, contact CCLASweb@yahoo.com. 8. 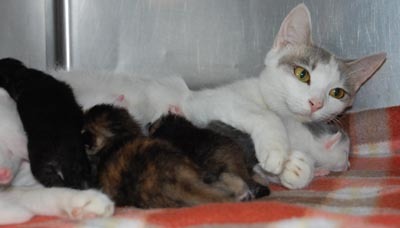 Are you available to foster a pregnant cat with a litter of kittens? If so, please contact our foster care coordinator at CCLASweb@yahoo.com for an CCLAS foster application. It is a 2-month commitments and proper accommodation are necessary. See below for more information about fostering. 9. Throughout the year we need volunteers to help with scheduled fundraisers such as our Hair of the Dog Happy Hour, Dog Wash, and Arts Festival Bake Sale. The best way to get involved is to email CCLASweb@yahoo.com or attend the members meeting prior to the event. 10. CCLAS and the Lakewood Animal Shelter always appreciate donations from the community. Monetary donations go toward our foster care program, veterinarians bills, and our spay and neuter program. Download a form or pay via PayPal. 11. If you would like to donate supplies to the shelter or start a community drive, here's a list of items always needed. We prefer new unused items, due to storage capabilities. And remember that the Shelter can always use towels, sheets, some blankets, pet beds, etc. If you have any questions, call the shelter at (216) 529-5020. More information about becoming a "Shelter Volunteer"
Personal efforts by people like you help provide our community’s stray cats and dogs with a better quality of life during their confinement and a better chance of finding a new home with a caring, companion family. In addition to participating in our fundraising activities, we also welcome volunteers at the Shelter. Shelter Helpers are dependable persons, 16 years and older, who help the Warden on duty on Saturdays between 11:00 am to 4:00 pm. If you are interested, please contact us with questions or download an application. Completed applications should be mailed or dropped to the City of Lakewood's Department of Human Services at 12805 Detroit Ave.
More information about becoming a "Foster"
We are in desperate need of families that can foster kittens, or, less often, puppies. On average we need to foster 30-40 animals each year. These animals may be pregnant cats and dogs, mothers and their litters, or orphaned litters. All are in need of a loving home environment until the babies are born, weaned, and of an adoptable age. Food and supplies are provided. If you have room in your home and heart for these litters, please contact us for an application. Ellie was adopted while in foster care after her spay.